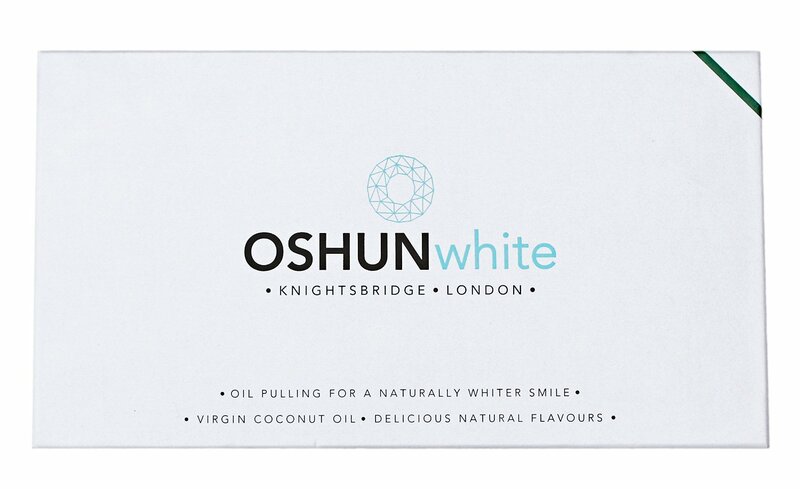 The OSHUNwhite oil pulling kit is excellent for beginners and for those who have done Oil Pulling before. The kit arrives all packaged up in a luxury white box that you take the lid off and are greeted by a booklet which details all you need to know. "OIL PULLING HAS BEEN PRACTISED FOR THOUSANDS OF YEARS AS PART OF THE ANCIENT INDIAN TRADITION OF AYURVEDA. THE PRACTISE INVOLVES SWISHING A SMALL AMOUNT OF COCONUT OIL AROUND YOUR MOUTH FOR BETWEEN 5 TO 15 MINUTES EACH DAY. OIL PULLING WORKS TO REDUCE THE LEVELS OF HARMFUL BACTERIA IN THE MOUTH. THIS NATURALLY REDUCES PLAQUE, WHITENS TEETH AND FRESHENS BREATH. COCONUT OIL, IN CONVENIENT SACHETS." SPEARMINT, CRUSHED LIME, WILD CHERRY, PEPPERMINT. 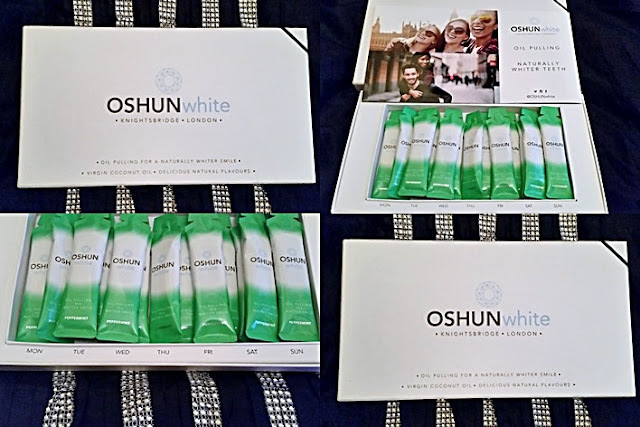 You receive 14 sachets which is two weeks worth and the inside of the box details the days of the week, so you know and remember to take one. Plus you will know when you are running out, to order more. The sachets are 10ML each and as it details in the booklet if the oil feels hard in the tube, before opening, rub in hands and this will warm up the oil and turn it into a liquid, as the oil will be solid at room temperature. You tear off the top of the sachet which is really easy and squirt the oil into the mouth. Swish the oil around for up to 15 minutes but if you are not used to oil pulling start off at five minutes and then work up to the 15 minutes the next few times. The oil really does taste lovely as i chose the peppermint flavour and it made my mouth feel fresh and clean. After you have reached the desired time spit the oil out in a bin, as if spat down a drain, the oil might turn to a solid and block it up. My whole mouth and every tooth felt really clean even between teeth. If your looking to start oil pulling or your looking for another oil pulling brand, i highly recommend this luxury kit that contains all you need, to start you on your oil pulling journey. X Neal.